The Academy of Physical Therapy Education's mission is to inspire all PTs and PTAs in their roles as educators and to enhance the development and implementation of evidence-based education practices. Only members of the Academy of Physical Therapy Education may participate in any or all of the Special Interest Groups (SIGS) listed below. These SIGs were developed to provide an avenue for networking with physical therapists expressing the same professional interests. The Academic Faculty Special Interest Group (AFSIG) serves as a forum for sharing and exchanging information about faculty matters and as an advocacy group for academic faculty in addressing issues of concern in physical therapy education. The Anatomy Educators Special Interest Group (AESIG) serves as a forum to promote professional development, research and educational excellence for those teaching anatomy in physical therapy (PT and PTA) educational programs. The Clinical Education Special Interest Group (CESIG) serves as a resource and forum for individuals who have a professional concern for the coordination, implementation, and evaluation of clinical education for physical therapists and physical therapist assistants. 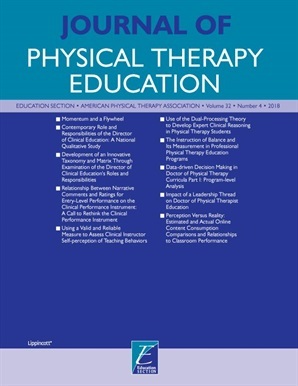 The Physical Therapist Assistant Educators Special Interest Group (PTAESIG) serves as a resource and forum for individuals who have an interest in physical therapist assistant education. The Residency/Fellowship Education Special Interest Group (RFESIG) provides a forum where residency/fellowship faculty including program directors, coordinators and mentors promote excellence in residency education. The Scholarship of Education Special Interest Group (SoESIG) provides a forum where both academic and clinical educators will promote and enhance the quality of educational scholarship in physical therapist education.